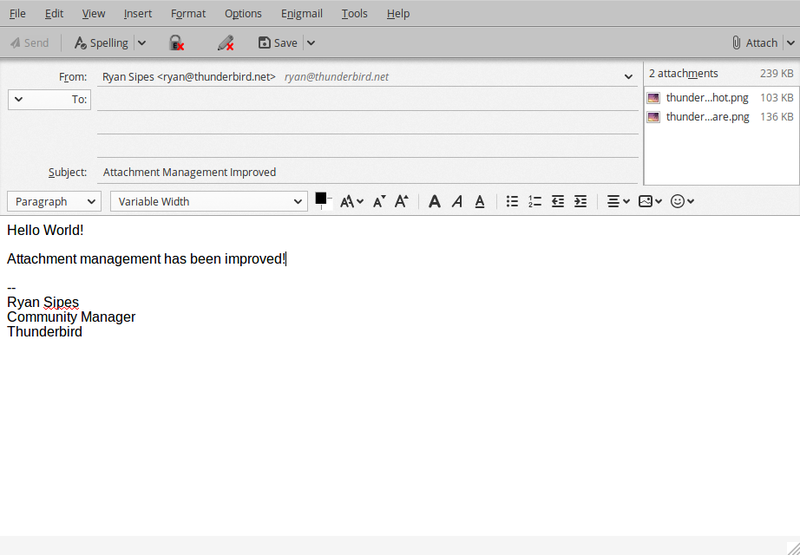 Thunderbird 60, the newest stable release of everyone’s favorite desktop Email client, has been released. This version of Thunderbird is packed full of great new features, fixes, and changes that improve the user experience and make for a worthwhile upgrade. I’ll highlight three of the biggest changes in Thunderbird 60 in this post. For more information on the release check out the list over on the support website and the full release notes over on our website. Like Firefox, Thunderbird now has a new “Photon” look. Tabs are square, the title bar can be toggled on and off, resulting in some saved pixels so your Email can shine. There are also new light and dark themes that ship with Thunderbird by default. Additionally, there are multiple chat themes now available. WebExtension themes are now enabled in Thunderbird as well. Also, Thunderbird has a new logo accompanying the new release! We’re very pleased with the new branding that mirrors the Quantum-y upgrade of our sister project Firefox. You can see all the branding updates on Identihub. Identihub is run by Ura Design and they have been a great design partner for Thunderbird, spearheading the logo update as well as helping out in various other ways. Thunderbird 60 features several improvements to attachment handling in the compose window. Attachments can now be reordered using a dialog, keyboard shortcuts, or drag and drop. The “Attach” button has been moved to the right side of the compose window, above the attachment pane. The localized access key of the attachment pane (e.g. Alt+M for English) now also works to show or hide the pane (on Mac, it’s always Ctrl+M). Hiding a non-empty attachment pane will now show a placeholder paperclip to indicate the presence of attachments and avoid sending them accidentally. The attachment pane can also be shown initially when composing a new message: Right-click on the pane header to enable this option. In this new version of Thunderbird there are various improvements to the Calendar. For instance, the calendar allows for copying, cutting or deleting a selected occurrence or the entire series for recurring events. Calendar provides an option to display locations for events in calendar day and week views. Calendar now has the ability to send meeting notifications directly instead of showing a popup. When pasting an event or task, calendar lets the user select a target calendar. Finally, email scheduling is now possible when using CalDAV servers supporting server-side scheduling. 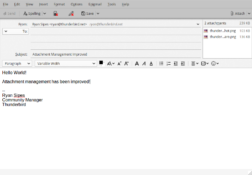 Outside of the changes described above there are many other improvements and bug fixes in Thunderbird 60. To get an idea of the full scope you can check out the great list over at the Mozilla Support site or the release notes. Lastly, you can give Thunderbird 60 a try by downloading it here. If you want to support the development of Thunderbird, please consider making a donation. Did you solve the enigmail encryption issue, also when will you guys launch an android app version ? Been (and still) using the beta for ages and it is much improved product! Good work, am a massive fan and have been using Thunderbird / Firefox for longer than I can remember. Great update! My respect and appreciation for all the contributors. I was eagerly waiting for this release, so I installed it right away. 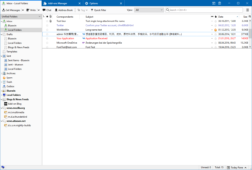 The square tabs and Photon icons give Thunderbird a much needed fresh look, in line with Firefox Quantum. It’s great to see the FF and TB desktop icons next to each other, like brother and sister, knowing that both open-source projects have been receiving more attention in comparison to a few years ago. The many improvements (show location in calendar, attachment handling, security updates etc.) together with the careful refresh of the UI (without breaking people’s habits nor removing functionality) deserve much praise. Hopefully, older add-ons will be upgraded and new ones will be created, like it was the case with FF Quantum. Thunderbird 60 has yet to reach me on either Linux or Windows. Perhaps the post should have made some mention of a staggered roll-out. The changes in version 60 seem welcome. Thanks for this effort. Really looking forward to that address book rewrite you talked about on the Bryan Lunduke show. Please, add custom fields and tabs for every contact and enhance the import ability from other formats/platforms! Any procedure to migrate from Thunderbird 52 to Thunderbird 60? There will be one in place once 60.1 release. We aren’t forcing an update at the moment from 52. You can download and install TB60 and your settings should transfer over. Thank you for this information, I deeply apreciate it! Generally the point releases are 6 weeks apart. So, we’ve got approximately six/five-ish left? Thanks for Thunderbird and this effort. Great work. Unfortunately, had to revert back to version 52.9.1 as 90% of extensions I use will not function with version 60. What extensions are you using? It is a good idea to contact the authors and let them know that you would like them to update their add-ons for Thunderbird 60 compatibility. I can afford to sacrifice these 25 pixels, where is this toggle? I can’t stand the look without the title bar but I’ve gone through the menus and I don’t see any option to get the title bar back. It’s in Preferences -> Advanced -> Config Editor -> mail.tabs.drawInTitlebar, you can set that setting to true or false. Oh, of course it is! Why didn’t I think of that myself! It’s so obvious! Seriously, why make such a jarring visual change, make it the new default, make a point of saying that “it can be toggled!” but neglect to mention that the setting in hidden in the advanced config, under a completely non-intuitive name? “Dark Theme” is kinda joke, as only the perimeter appears dark. Email-list & folders are light, which do hurt my eyes. Sorry to hear that. What platform are you on? Could you open a bug in bugzilla with a screenshot? Absolutely love the new update, just found out about it today when reinstalling Thunderbird on a client’s machine. Quick question, is there a way to make it so attachments on received messages are on top instead of at the bottom where I commonly miss them? I keep seeing that there is a dark theme… where do I get it? It comes pre-installed now. Look for “add-ons” in the hamburger menu and then hit “themes” in the tab that comes up. You should see it there. First congratulations, I like the new Thunderbird, it was a lot easier to set this one up over the past versions, for me. Some background, I am 74 and have been using computers since Windows 95, however I am not by any means an expert at it. My favorite over the years was Netscape Messenger email client. This one is close. During setup I downloaded my address book from gmail as a .csv file as instructed and after a bit of head scratching figured out how to import it. What I got was a garbled mess, I then had to go in and manually update each address with their email addresses etc. My question is why won’t the program recognize that I had the window mail app on my computer with a full address book and import from that, or as I was downloading my folders and mail from gmail it wouldn’t pickup on the address book and download it then too? That seems to be a given task to get your email address book ported over without jumping thru hoops to get it done. Other than that again congratulations on a very good product, I enjoy it a lot. Because of update many plugins are now incompatible with 60.0 version, so I ask for must have function that not exist by default in Thunderbird: work in tray, and minimize to tray after close windows or Alt+F4. Without this use mail client is hard because you can accidentally close it and miss your incoming emails.